I’ve had a lot going on lately. I was assigned a very challenging teaching assignment. The weather has been beautiful so we’ve spent a lot of time outside walking and fishing and playing. Last but not least, today is Easter so we are visiting with family and friends. Happy Easter to all my blogging friends! Every year we make a bunny cake. This year we tried to ice it too early so he looks a bit messy but still tastes great. Through all this busyness I’ve still found time for crochet. I don’t know what I’d do without it. Here are a few snapshots of what’s been on my hook. I have been working with all of my springy pastel colors. A pin I made my mom for her birthday this week. The button came from my grandmother’s button jar. I have not yet wore her out on crochet gifts! The flower pattern came from Little Doolally. I’m always swooning over pictures of crochet bunting. I love garlands and bunting!! I finally made my first and started out simple with a mini triangle bunting. Adorable Granny Heart Purse by Daisy Cottage designs. It is supposed to be a purse for a little lady, but until I have a little lady to give it to it works great as a scissor bag to hang on the door. Hope you have been enjoying the first days of spring like I have! I still remember the feeling of waking up as a child and being told it was a snow day. One of the great things about being a teacher is having snow days. I get very nostalgic on these days, probably because I still get that same rush of excitement I got when I was a child. Here in WV we had a whole week of snow days last week. Although I did start worrying about what my paycheck would look like, I did get to spend a lot of time with my yarn–working on long lost projects and starting new ones. I had learned most of the basic amigurimi skills and made small ornaments and such, but I had never made an actual stuffed amigurimi animal. I sat down determined on one of my days off. Looking through my many pins I found an adorable little lady bunny. It didn’t take me too long to make the pieces, and I was feeling really good. Then I got to stitching the parts together. It took me two days, having many problems with the nose and eyes and feeling like she would fall apart, but I have to say I am very pleased with my first amigurimi animal. I think I will name her Lola and may have to give her a small embellishment on her dress. If you would like to make your own head over to Zan Crochet for an easy to read free pattern! I have added a couple new fun things to my daily routine. The first is a five year memory book my mom got me for Christmas. When I was younger I had time to keep a journal with long daily entries but not so much anymore. That is why I loooove this memory book. 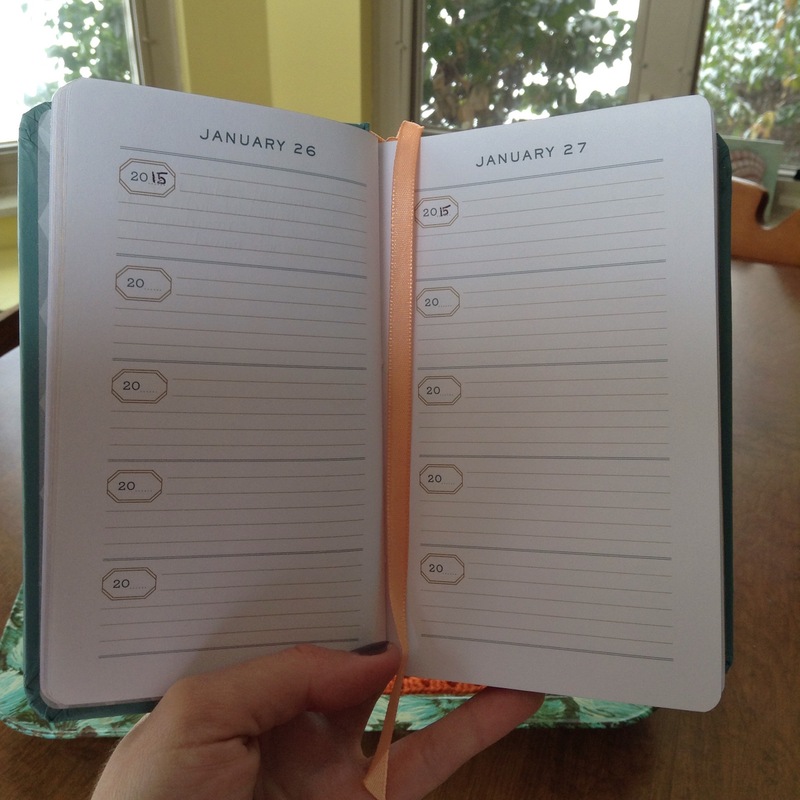 You write one line a day each day for five years. I can’t look back on previous year’s memories yet since this is the first year I’ve written it it, but it will be neat to do. The second thing I’ve started is crocheting one square a day. I started out wanting to make a mood blanket for 2015 but then realized I sometimes do not like to look back on my moods. Although I’m sure my mood will influence the color choice for the day, I’m not going to have a color scheme pinpointing each mood. It will end up as a patchwork granny square blanket. I used The Purl Bee’s Classic Granny Square Pattern to make a six round, one color square. I chose to use a smaller hook since I tend to crochet loosely. I really hope to stick to it. This will be my first granny square blanket! I have been enjoying the snow here in WV…it gives me more of a reason to stay inside with my yarn. 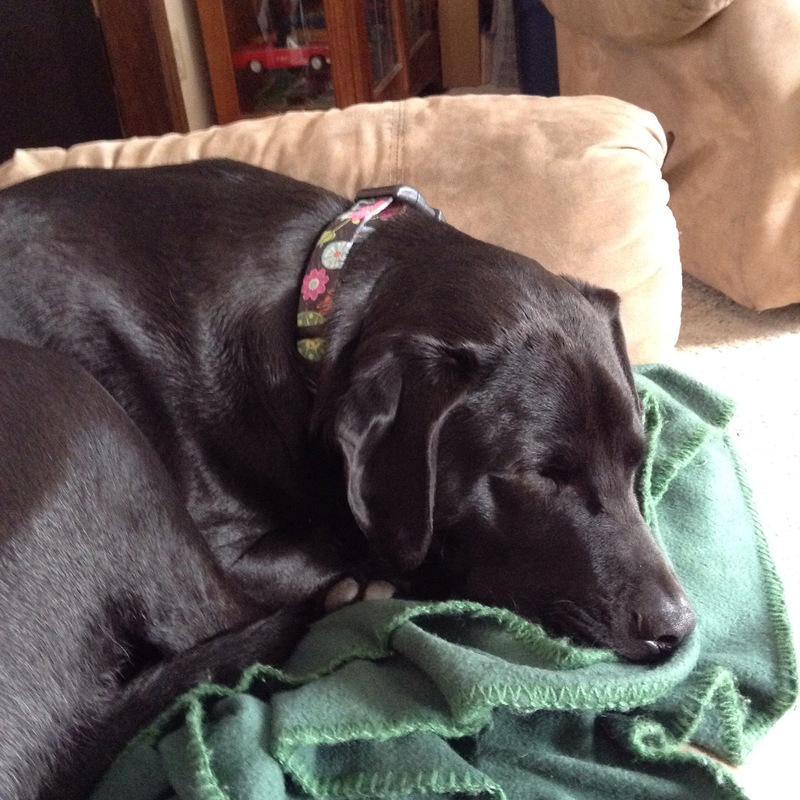 My black lab Stella and I have spent all morning cuddling on the couch. (I think she’s enjoying it also 😉 ). I have finally finished my first baby blanket! Sadly I will not get to keep it and enjoy it, but my friend and her new baby will hopefully get many years of cuddles out of it. As can be expected I took many, many pictures, but I will just share a few with you. If you did not see my last post, I used Lucy from Attic 24’s Neat Ripple Pattern. 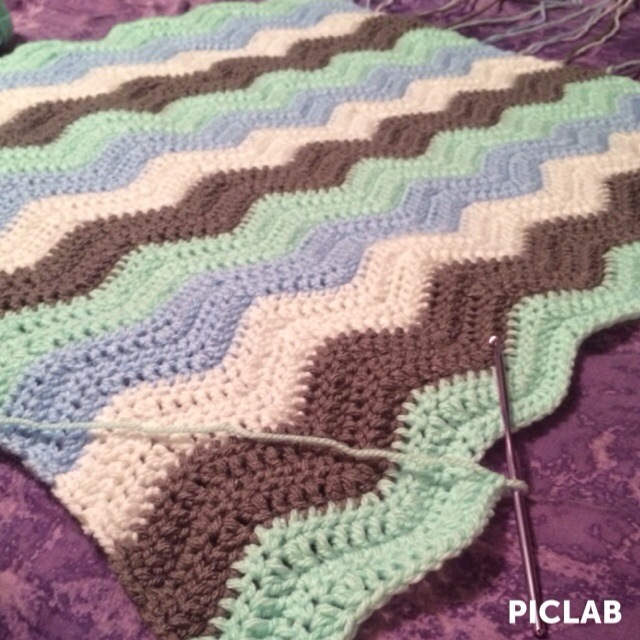 I made each ripple of color twice as thick as the pattern indicates. Now I can get back to working on my own ripple blanket. 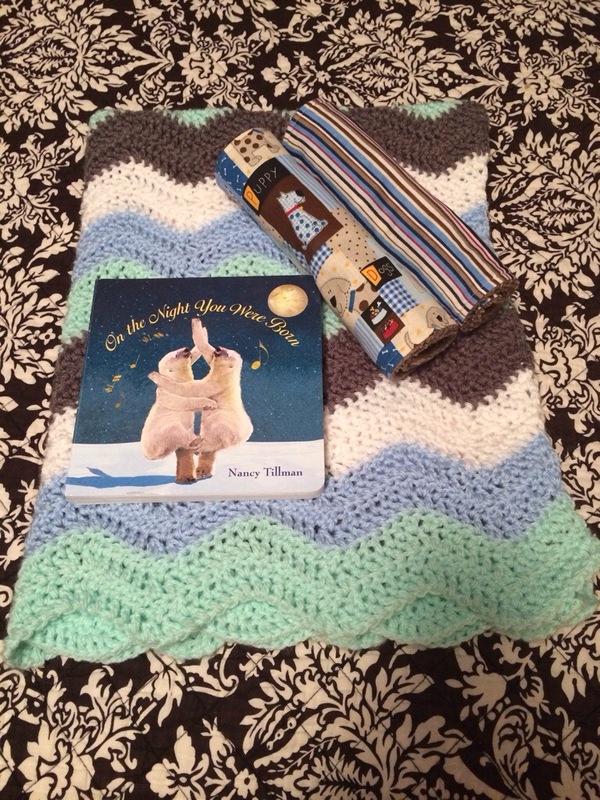 Ready to be shipped off along with two homemade burp clothes and an amazing book. I have literally bought yarn for three different projects in the past two weeks, and last night I bought even more. 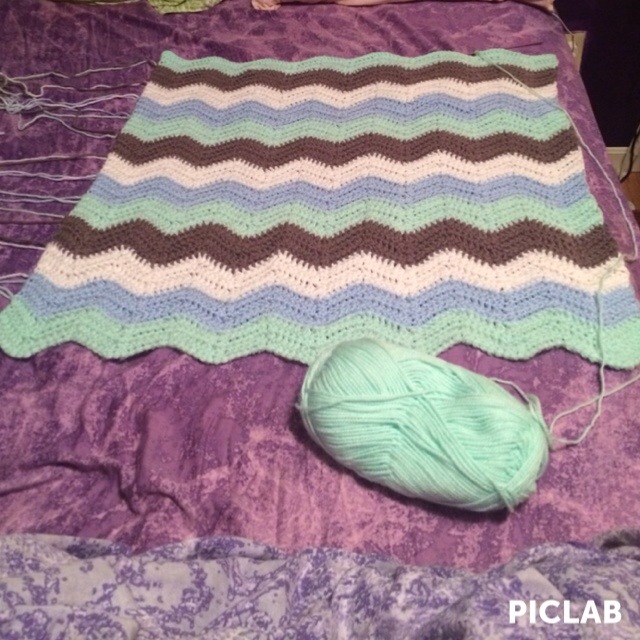 This time I’m really going to stick to this one project (while working on my ripple blanket here and there). We will see how that goes. I decided to make Lucy’s Jolly Chunky Bag. I chose the smaller of her two bag patterns because I want something I can carry around town. I am someone who normally carries a larger purse, so I really hope it will be big enough, although I think the larger bag pattern would be too large. I tried to find a photo of someone actually holding the bag but failed in my attempt. On another note, I have quickly realized that sometimes when browsing patterns online I fall more in love with one’s color choice vs. the actual item. I usually go with either pastel colors or bright colors, so naturally I fell in love with Lucy’s color choices for her Jolly Chunky Bag that were a little bit of both. That being said, I chose similar colors in hopes that I won’t stop halfway through the project and not like it as I have in the past. As a beginning crocheter, I have had so much fun experimenting with different color combinations. That’s half the fun, right? Here are the colors, all chunky and new. All are Lion Brand Hometown USA except the lavender which is Bernat Softee Chunky. The Hometown USA yarn was fun to look at, because each yarn is named after a state. For example, the pink is named Honolulu Pink. I hope to get started tonight. 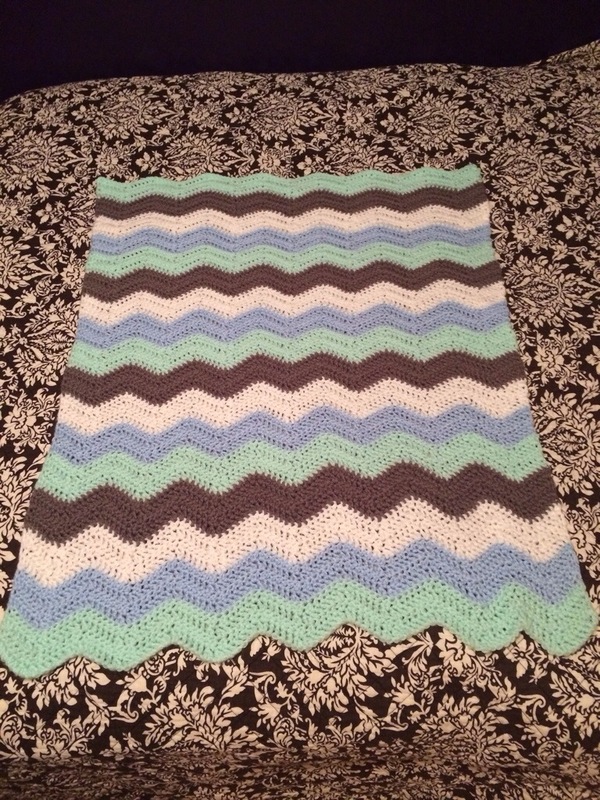 My First (Baby) Blanket Ever! As I have said before, I am fairly new to crochet. I am almost finished with my first blanket ever. I started a blanket for myself and then found out a dear friend was pregnant. What to do other than put my new skill to use? 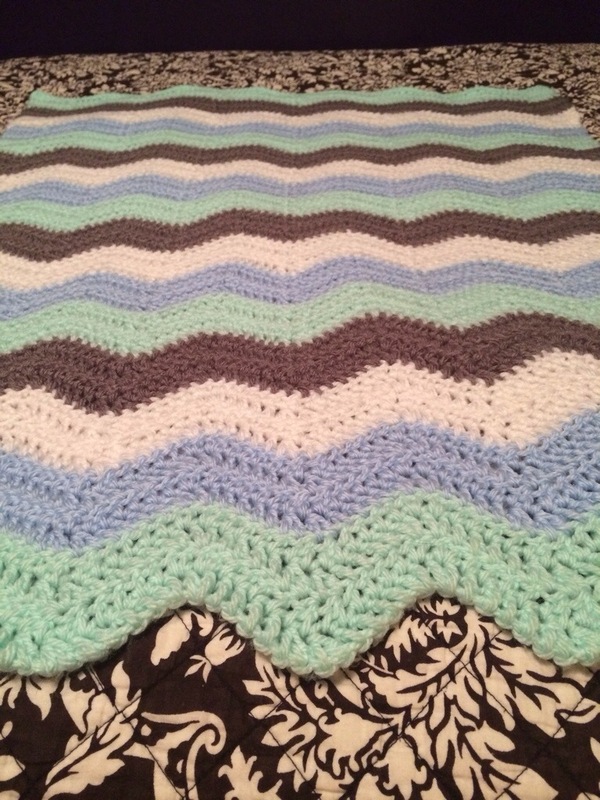 I used Lucy from Attic 24’s Neat Ripple Pattern, which is the pattern I also used for the blanket I started for myself. I am so so glad I found her blog early on in my crochet journey. She writes the best tutorials and explains everything so clearly. As you can see from the picture, I still have all my loose ends to weave in and I think I’ll need to make 5 or so more color changes. I’m debating on whether to block it or not. I’ve never blocked anything before and don’t know if I even have anything large enough to do it on. Any suggestions would be greatly appreciated. 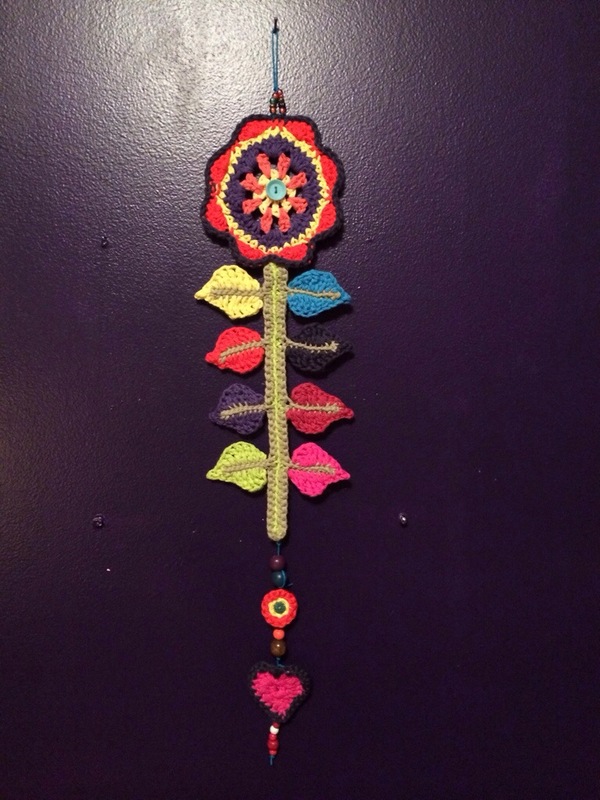 Another project I have done from Lucy’s blog is her Happy Flower Decoration. I wanted to make something special for my mom on Mother’s Day and this was absolutely perfect. As a beginner, it took me a while to make all the small pieces but I loved every minute of it. It has been my favorite small project yet, and of course the detailed tutorial made it stress-free. I will be sharing my finished baby blanket before I ship it off to a dear friend and will hopefully be sharing progress of my own ripple blanket. If you have not checked out Lucy’s blog, Attic 24, do that right now for tons of cute tutorials. I am determined to one day make every single pattern. 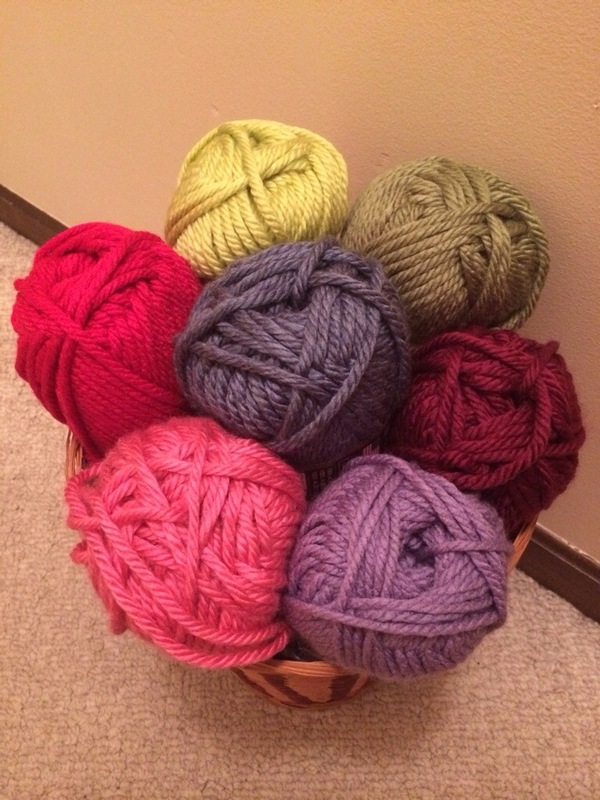 Have a wonderful, yarn-filled day! I was so happy to receive an Amazon gift card for my birthday. 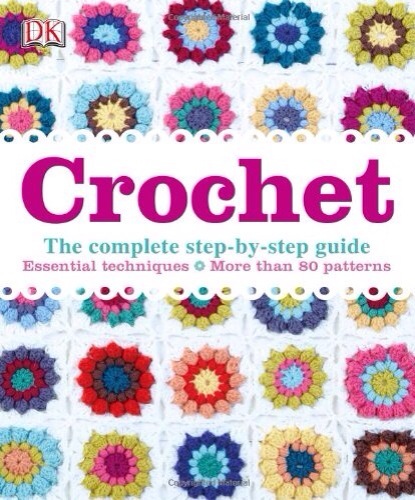 I immediately retrieved the list of crochet books I have been wanting to buy. Amazon told me my order will be shipped anywhere between June 20 and July 8. Keeping my fingers crossed that they will get here in a timely and safely manner. Did I mention I’m very impatient when it comes to my crochet??! I will be posting a review of these books hopefully sooner than later. 1. 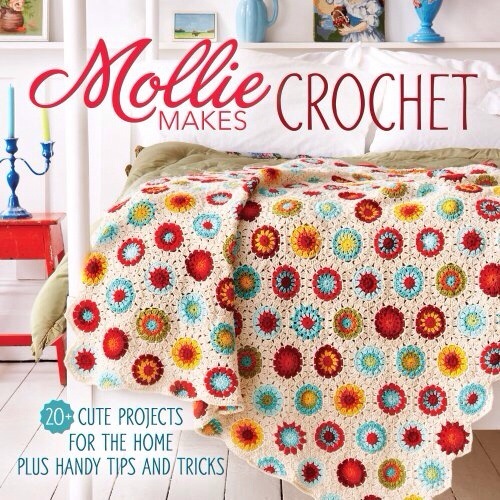 Mollie Makes Crochet: 20+ Cute Projects for the Home I love the magazine so I have high hopes for the book. Although some of the reviewers didn’t seem too pleased, most of them were very seasoned crocheters. A somewhat beginner like myself will hopefully find the book more useful. 2. 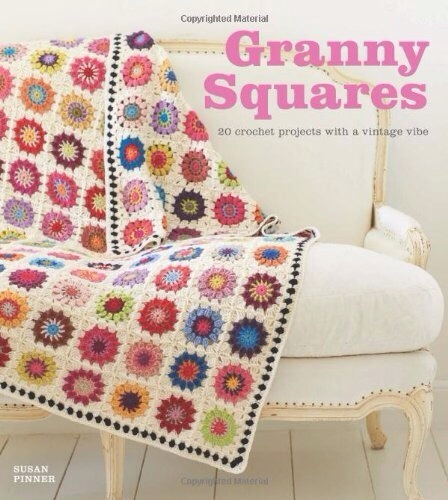 Granny Squares: 20 Projects With a Vintage Vibe I was sold by Amazon’s “Look Inside” feature. Although I did not see in the reviews that the patterns are in UK until after I bought it, I think I would have bought it anyway. One of my favorite bloggers, Lucy of Attic 24, uses UK terms in her patterns but the short time it takes to translate (if she hasn’t already done so) is totally worth it! I cannot wait to make the pillow covers from this book. 3. Crochet: The Complete Step-by-Step Guide This will probably be the most used out of the three. I’ve heard it called the crocheter’s bible. Patterns galore! Let me know if you have any helpful hints on these books.